I thought this was a good question because, with the Jedediah Shorts Sew-Along beginning tomorrow, I am sure quite a few people are considering ways to create the perfect custom size! Evidence of this is Elena of Elena Knits‘ recent post on adding width to the thighs and knees in order to better suit her athletic partner. In order to help Eadaoin and others with any grading they might choose to do, I’ve illustrated how I would approach grading from a size 40 waist to a size 36 seat. What do you think of my approach? Do you know of any better way to do this? Click on the images to see them full size. The red lines indicate where you should draw new lines using a curved ruler (or eyeballing a smooth curve). 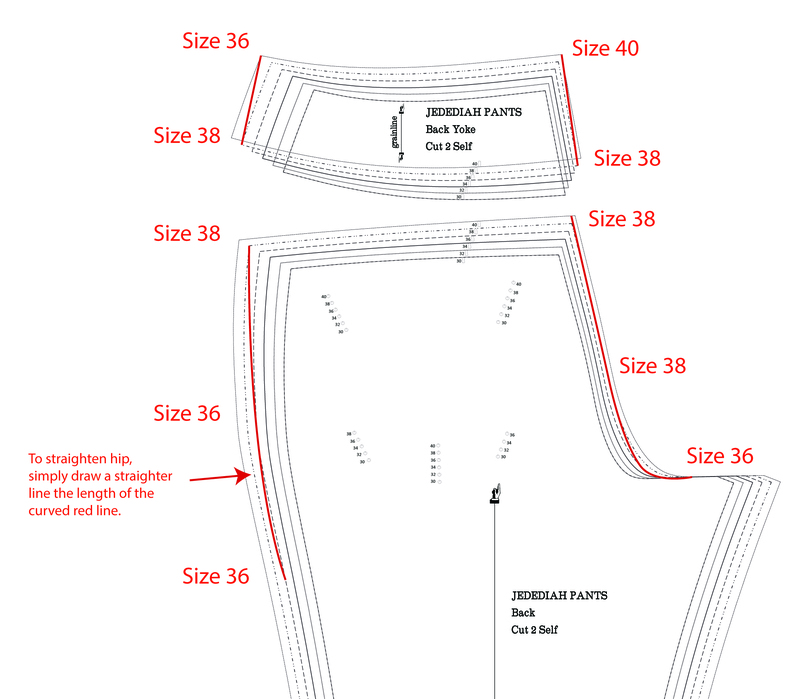 After drawing these lines you can cut out the pattern using the size 40 waistband, the graded lines and then the size 36 legs. 1. The front pockets could gape a little too much: If you mock-up the pattern after doing your grading you will see if this is the case. You can remove the excess fabric by creating a deeper seam allowance for the front of the pants at the waist seam and the side seam (flattening the front of the pants onto the pocket lining and facings). 2. The seat seam might not fit as well as it will the way the pattern was originally drafted: Grading between two sizes will change the curve of the seat seam. If you are worried about opening the can of worms that adjusting a pant seat seam can be (ug!) then consider leaving the seat seam as is and only doing minimal grading along the side seams. I know this isn’t the correct way to approach things but it is far less intimidating if this is your first time adjusting the fit of a pattern! Only do this if you are grading up or down ONE size (meaning you only need a small adjustment). If you DO need to grade the seat seam, try to keep the shape and length of the new curve as similar as possible to the old curve. 3. The thigh area might become too baggy or too tight: To fix this, you will simply need to extend your grading down the leg further so that the shift between sizes is more gradual. At the tight or baggy point, make sure to keep your graded line closest to the larger or smaller size accordingly. If all of this has got you a little overwhelmed, consider buying a cheaper pants fabric and just sewing them up in the closest waistband size for the sew-along – even if they’re not perfect, they will be a good start and will likely fit as well as RTW pants do. From that point on you will feel comfortable with the sewing process and more familiar with the pattern so you will be ready to begin your custom fit adjustments for the next pair! Basically, what I am suggesting is – don’t freak yourself out and just let the sew-along pants be your wearable mock-up! I hope this helps everyone prepare for the big day tomorrow! I will post the first sew-along post in the morning so that you have all day to make time to cut out your fabric. 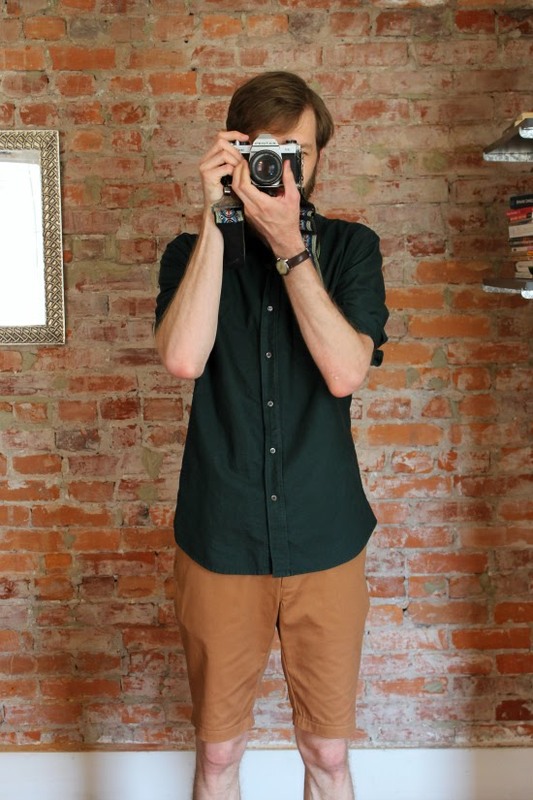 By the way, check out Andrea of Four Square Walls‘ not one but TWO pairs of Jedediah Shorts – they look wonderful! I love the tobacco colored twill she’s used for her second pair! Categories: Jedediah pants, Tutorials | Tags: four square walls, grading, tutorial | Permalink. Thanks so much for this tutorial. It’s very helpful!! I know this comment is years later from the posting, but I’m hoping you’ll see it. 🙂 I graded from a size 38 hips to a size 40 waist. Do we need to modify the Pocket Facing pieces too once we’ve graded? Thank you. slight edit: that should read 16″ calf….i’m spindly, not a triangle…. I notice on the pair of jebs that i knocked up (which by the way was a total pleasure thanks to these blogs :P) that the fit is generally fine -waist, yoke area of seat, even the fronts of the legs – but the back of the legs i could easily lose 2″ of fabric per leg…and perhaps an inch on the seat. Would this just be a case of chopping 2″ off of the outseam of the back leg pattern piece, blending it out about level with the pocket opening? or is it not that simple? Ha ha 🙂 looks like you have everything figured out! I’m glad you liked the tutorial, but I hope you don’t have to use it! No problem 🙂 I hope it helps a few people!